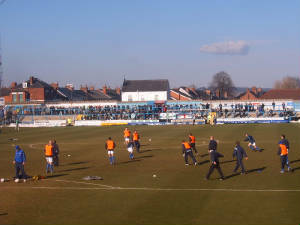 With Lincoln's trip to Carlisle being called off, me and my friend Ian decided to go to a random game and after our first choice was postponed, we decided to make the lovely trip to Saltergate, a ground that I had previously never really wanted to visit. The oddest thing about Chesterfield, before you even get near the ground is the crooked spire, you have to see this to truly understand how odd it is. Anyway, once we finally go the ground (after finally managing to park). We tried to go to the club shop but after asking 2 people, who had told us it was in different locations, we decided just to try and find it ourselves and after we did, we wish we hadn't really bothered. The shop itself was fairly large, however, the area where people could walk around was the size of most people's dining tables, it was tiny and by the looks of it, there's nothing really worth buying. So, into the ground. We decided to go into the home terracing known as "The Spion Kop". 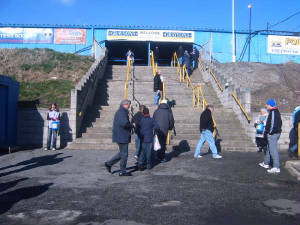 After climbing a large set of stairs, we noticed that there was a large area behind the terracing where you could just do whatever in before actually going to watch the match. The only problem with this stand was that several pillars get in your way if you stand in certain places, however, you do get an excellent view of the action if the post isn't in your way. To the left of us was a covered terrace, either side of this you could still see all the terrace and rests, however, the bit in the middle was an extremely small seated section which although ran the length of the pitch, couldn't have been more than 7 or 8 rows high. 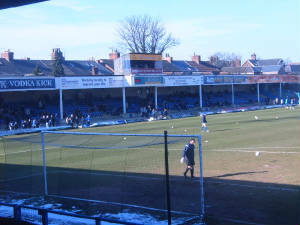 The away stand was at the opposite end and it had no roof and therefore, no pillars in the way, however, no noise could be made from this end at all and even though there were around 250 Yeovil fans in that end, you couldn't hear them at when they were celebrating any of their 3 goals. 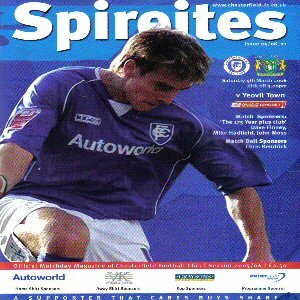 The final stand to our right was an incredibly old stand with wooden seats (wasn't that banned now). This stand looked incredibly uncomfortable but must offer a good view of the action. The atmosphere at Saltergate is almost non-existent with only the occasional "Come on Spirites" sounding from the Spion Kop. This was disappointing because an end with around 2000 people in it should at least have a decent level of atmosphere coming out of it. 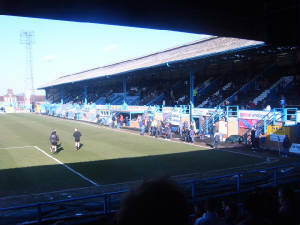 The one thing I really liked about Saltergate was that it felt like an old-school football ground and unlike several other stadiums in the country, it automatically gave off the feeling that football should be played here. Overall, I would actually recommend Saltergate as a day out, the vast majority of fans are friendly, there's a good footballing feel, the programme isn't too bad and best of all, if Chesterfield play like they did when I went, your team will easily get 3 points.